For many years MINI was not including floormats in any of their vehicles and opted to try to get another $100-$300 out of their buyers when they custom ordered their MINI or when they were about sign on the dotted line. It's one of those sneaky items that may go by under the radar as you're looking at the cool interior, hip exterior design and dreaming about the go kart handling. More and more they are including them from the factory or the dealers are adding MINI floormats as a line item on the window sticker but for many MINI owners will simply drive off the lot and realize a few days later that there's no floor mats in their MINI! One thing I'm sure of is that every MINI Cooper, Convertible, Coupe, Clubman, Countryman, Hatchback should have a nice set of floormats to protect the 'real' MINI carpet from getting abused- especially near the gas pedal and brake pedal where the heel rest is. Of course the passenger side MINI floor takes it fair share of abuse if you use your car to transport more than one person and if you have kids or haul other full size humans around in your MINI (reluctantly) you'll find the back seat carpet gets abused too. The little crumbs and rocks and other junk on shoes nearly always finds its way to the carpet. I always have floormats in my MINI and actually rotate 2-3 sets that I have throughout the year. In the winter I have my heavy duty black rubber all weather mats and then switch to the carpet MINI floormats in the spring and summer. I also have of the Urban striped carpet mats for my MINI that I swap in to spice it up a bit. The striped mats add a nice upscale look to the MINI while the rubber mats are more utilitarian and rugger but still look nice in the MINI. They have a nice MINI logo and the molding of the rubber accents look pretty cool. The black carpet mats are very discrete and do their job without calling attention to themselves which a lot of people prefer. The best feature of all of these is they have a velcro plate that attached to the carpet and on the back of the driver side mat there are large velcro pads that attach to the plates to keep them from sliding around. If you're looking for a floormat for your MINI that REALLY stands out you may want to checkout the Rennline Aluminum floormats/ Trackmats for the MINI Cooper. They're completely awesome. Check them out. If you've never seen the CocoMats we offer for your MINI you'll want to at least check out the pics of them on our site. They will bring a certain classic retro look to your MINI while offering top notch quality and construction. Protecting the carpet of your MINI with high quality floor mats should be on the top of your list and these cocomats for the MINI Cooper are built like tanks. While your shopping for floormats for your MINI Cooper, Cluman, Countryman or Coupe, etc you will likely want to think about protecting the carpet of your MINIs trunk area. A simple trip to Home Depot can end in a disaster just as fast as a trip to the grocery store and I can't think of a worse smell than rotten milk saturated into the carpet on a hot day or the smell of mulch from a torn bag. The easy solution is to pick up a rubber boot trunk liner mat for your MINI trunk to keep it looking clean and protected. They're easy to clean and look great for everyday use. Okay, so we've cover the front and back floormats and as you can see there's some great floormat options to choose from. 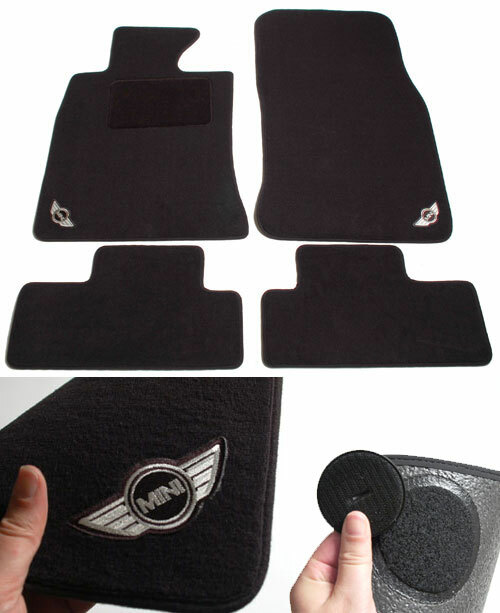 MINI Cooper Rubber Floormats, MINI Cooper Carpet Floormats, Aluminum Floormats and the modern striped Urban floormats. They next product to consider especially if you have pet/dog/cat, etc and enjoy taking your pet with you around town or to the park you'll quickly find that pet hair and odor as well as general wear and tear from getting in and out of your MINI will make your interior look pretty shabby. If you don't mind leaving your MINI Cooper back seats down and putting one of these trunk are pet mats in you'll save that abuse to your seats and keep the hair from making its way between the seats and onto the carpet. Plus it will allow your dog more room to get comfy and make it easier to get in and out via the trunk. This pet mat is specific to the MINI Clubman while this pet liner pad is designed to fit your MINI Cooper with the back seats up. If you have a MINI Countryman or Paceman and want to keep the back seats up while hauling your dog around this is the best solution I know about. And if you are cool with leaving your seats down in your MINI R50/R53/R56/, etc this full rear seat pet liner is the best product out there. Thanks for taking the time to read this blog post about MINI Cooper Accessories. Outmotoring wants to be your first choice for MINI Cooper Accessories. Have comments or questions about the various MINI Cooper Floormats or Trunk mats we offer? Please leave a comment below or contact us.